Today we’re going to look at another great product from Brookes & Hyde. 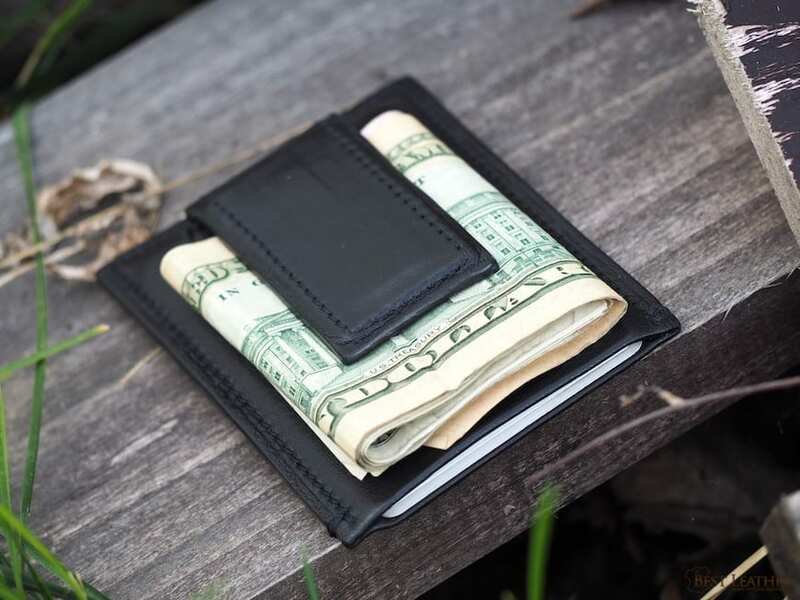 This Money Clip is made with soft Horween leather and gives those who carry cash a great, minimal option in high-end wallets. It’s been my pleasure to get to know Connor Sambrookes, owner and founder of Brookes & Hyde, over the last year or so and several reviews. Connor started Brookes & Hyde as a senior thesis project. Hoping to design shoes, he began work for a company designing products for some of the biggest names out there. 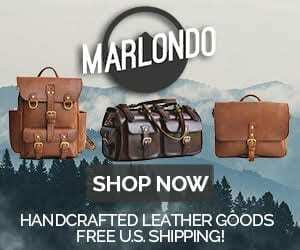 It was at this job the opportunity to apprentice under a highly experienced leather craftsman came about, leading to creating his own products and founding the company. Brookes & Hyde has grown quite a bit since we began working with them. The company continues as a one man show out of Cincinnati, Ohio, recently winning an audience choice award at a local ArtWork’s Big Pitch competition! This money clip is made with Horween Plush. This is a very soft leather that feels great in your hand. The largest main pocket is lined with the same. Edges are carefully painted and stitching is uniform. On the back, the money clip utilizes a nice and strong magnet stitched into the leather. Brookes & Hyde has always impressed me with the caliber of their construction, and this money clip is no exception. As you hold this wallet in your hand it’s hard to deny the luxury feel. This is definitely a minimalist wallet. The leather is very thin, resulting in a forget-it’s-there thin profile. I’d place card capacity at about five, three in the main compartment and one in each front pocket. Any more cards and it gets difficult to get them in and out, since they’re so tightly held together. The leather is also soft, however, and could be stretched to fit more. So stretchy, in fact, that it’s wise to face your credit card in the outermost pocket in, lest the card numbers become visible through the leather on the outside! 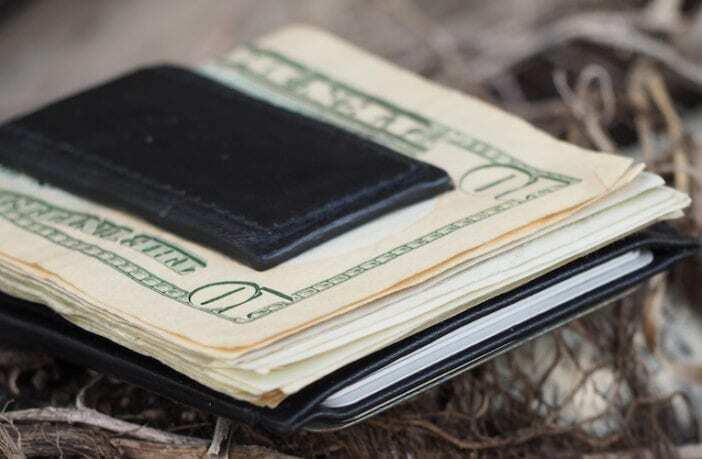 The money clip is definitely the trait that should make the decision on this wallet. The magnet is nice and strong. I experimented to find roughly what the capacity of the clip is. Ten bills, laid flat, aren’t going anywhere. If I fold those same ten bills once for twenty layers, it took some pretty serious turbulence to make them slip. Folded into thirds, for thirty layers, the bills held in rest, but easily fell out when disturbed. American bills push right up against the edges of the wallet size-wise when folded in half. If you only need a small handful of cards but like to carry a decent amount of cash, this should be a good choice for you. The Horween Plush leather is both soft and beautiful. The texture is smooth, having just the right amount of sheen. At the same time, from a distance, this is a very conservative and simple wallet. I’m a fan of these sorts of understated products, the ones that are truly appreciated only upon careful inspection. Pros: Minimal profile, soft and gorgeous leather, understated look, strong/high capacity money clip magnet, quality construction. Cons: Low effective card capacity, not ideal for rugged use. In conclusion, the Brookes & Hyde Money Clip Wallet is a luxurious and minimal wallet favoring the cash holders out there. Assembly is expertly done with details in mind and the Horween Plush looks and feels fantastic. While you’ll pay somewhat of a premium for these features, the price does roughly match up with what we’d expect from these levels of materials and craftsmanship. If you like to carry plenty of bills yet want a minimal wallet with a gorgeous understated design, this offering from Brookes & Hyde is for you.